What an incredible six weeks it’s been since joining Trimcraft! The time has flown by, it’s been so exciting, inspiring and, at times, a little nerve-wracking being on live TV! I’ve been made to feel very welcome with many colleagues offering to show me the ropes – and making me cups of tea in the office! The other guest presenters and demonstrators I’ve met have been a huge help to me whilst I’ve been settling in. Many of you will have seen my first shows on Create & Craft and its sister station Create & Craft USA. A large part of my role as Trimcraft’s Craft Coordinator is to showcase the products for sale through these shopping channels and give viewers the inspiration to use them in their own projects by demonstrating ways in which they can be used. This process starts with looking in detail at the product, whether it be a die, paper pad, stamp, embellishments or a kit compiled of a variety of these elements, and highlighting the main features and things that make them stand out. From there, together with Maxine, our other craft coordinator, we make samples using the products. These are sent to the channel for the team to use for screen shots during the live broadcasts. Then come the demos, planning how to showcase the products at their very best and considering who would like to use them. That could be hobby crafters, card makers, people who like to make things for their home, crafters who sell at fairs or have regular stalls and people who make their living selling the things they make. I need to make sure each demo is inspiring yet achievable and most importantly, can be replicated in the few minutes I have available during the shows. We try to fit in three demonstrations each hour, as well as explaining in detail what each of the products has to offer so as you can imagine, it can be a tight squeeze at times! I have been lucky enough to use some of the projects our design team have created as inspiration. With three per show, plus a few spare in case the director requests an alternative, sometimes it’s quite a production line! We always give the cards or projects that I make on the show away to viewers so keep an eye out for our show times as you could email in and win a project made live on the show. With live TV, the shows can be very unpredictable and it’s important to remain professional and calm whatever happens. Already I’ve had a few mishaps with the battery pack overheating on my microphone so no one could hear me and more embarrassingly, cutting through a score line on a card I was making which completely ruined the design! Luckily I had a spare card blank so could start again! We all make mistakes when crafting but doing it live on air can leave you a bit flustered! It’s been lovely chatting to some of the viewers on Facebook, Twitter and Instagram. 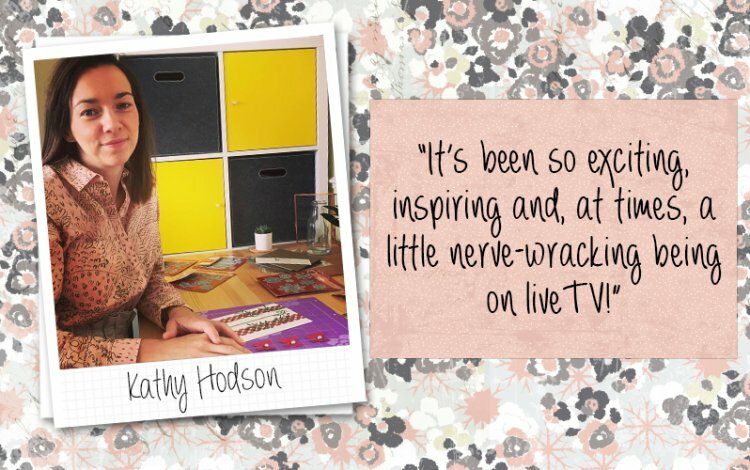 I’ve set up new profiles on each of these channels so please tell me what you think of the shows and show me what you’re making at www.twitter.com/KathyCraftsTV, www.facebook.com/KathyCraftsTV and KathyCraftsTV on Instagram. Thank you for such a warm welcome and your lovely messages so far. I look forward to bringing you more amazing products from the First Edition, Dovecraft and Simply Creative brands as well as inspiration for your crafty projects. Keep an eye out for my blog post next month!